Last September, I discovered that a single company was selling all 78 sakes rated 90 points or more by the Wine Advocate -- and only those 78 sakes, nothing else. Prices for those sakes, some of which were difficult to obtain elsewhere, were in some cases significantly higher than their original release prices from the breweries. I discovered that this company, The Taste of Sake, had connections to RobertParker.co.jp, and to the former employer of Lisa Perrotti-Brown, the Wine Advocate's Editor-in-Chief. Here are the two original posts: the first one and the followup. After my first post, Ms. Perrotti-Brown wrote, "We are investigating the facts behind these allegations ... What we need to establish is if that company had access to any of the sake notes or scores prior to publication, which is a situation we take the utmost measures to avoid. Even the suggestion that this could have happened is a matter we take very seriously." A year has passed. I have been asked by many people if I have any more facts on the investigation. I do not. The Taste of Sake site was taken down and is not up today. I wanted to know if The Wine Advocate has progressed with its own investigation, so last week I attempted to contact Ms. Perrotti-Brown. I do not have a direct email or phone number for her, so once again I tried to send an email through the company contact page. That email has received no response other than from a web administrator acknowledging receipt. Ms. Perrotti-Brown answered no questions about the story last year, and to my knowledge has answered no questions about it for any publication, ever. In what I believe is a total coincidence, at a wine event last week I ran into a PR person who previously represented The Wine Advocate, several hours after I sent Ms. Perrotti-Brown the email. I had, last year, attempted to ask questions of Ms. Perrotti-Brown through this PR person, without success, though she did acknowledge that she had communicated with Ms. Perrotti-Brown about it. The PR person asked if I had heard anything new about the story. I said that I had sent The Wine Advocate an email that very morning and that I planned to write this followup. "You better get a personal bodyguard," she said. We were having a friendly conversation and she may have been joking, but I must say I am disturbed that the thought occurred to her. The Taste of Sake was charging $5000 for the top-rated sake. It previously sold for $45 at the brewery. On Aug. 31, the day the Wine Advocate ratings were released, The Taste of Sake offered for sale all 78 sakes that received 90 points or more. 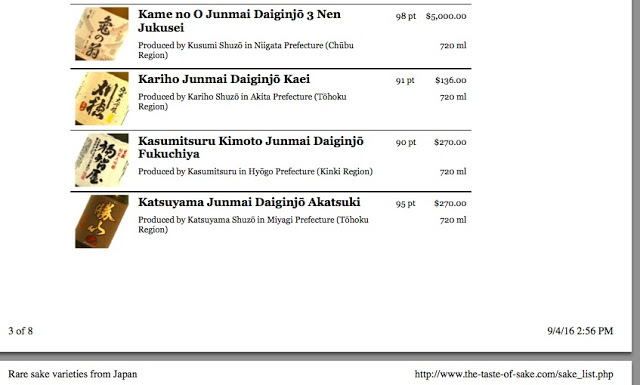 (I have PDFs of The Taste of Sake site, which has since been taken down.) The Taste of Sake did not offer any sakes for sale, not one, that did not get a Wine Advocate rating. Ernest Singer is Managing Director of Les Millesimes, a Tokyo-based wine importing and distribution company, and Ms. Perrotti-Brown's former employer. Singer is also Managing Director of Asia Business Consultants, which owns the subscription-based website RobertParker.co.jp. Les Millesimes and Le Caveau, a company that listed The Taste of Sake on its website as a subsidiary, share an address in Tokyo (this address is 〒135-0064 東京都江東区青海4-4-18). It was listed as the warehouse address for Les Millesimes and the head office of Le Caveau. Hirokazu Yoshida, who responded to my email to The Taste of Sake and called himself the company President, was listed on a Facebook page as an employee of both Les Millesimes and Le Caveau. I emailed The Taste of Sake and he responded. His initial email to me included the line, "Actually we are a wine importer Le Caveau Inc. in Japan and working on Parker high rated wines, and recently started to export sake." Less than two hours later, without any additional email from me in the interim, I got another email from Yoshida that included this line: "We have no relation to the Wine Advocate." I would love to know what evidence Ms. Perrotti-Brown has unearthed in her year-long investigation. Hopefully she will release the results soon.